We landed on the white sandy shores of Findhorn Bay, just beneath the tall pine trees of Culbin Forest. Having made sure the dinghy was secure, and the picnic gathered up, we climbed up across the grass and up the sandy slopes to sit beneath the trees. The sense of remoteness was amazing, like being on a distant Caribbean island. Yet only a few hundred yards across the bay lay the small houses of Findhorn, nestled close to each other for comfort. A bit like Swallows and Amazons! 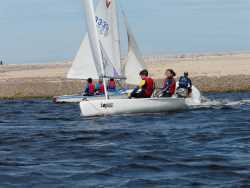 Sailing on Findhorn Bay is an experience not to be missed. Fortunately it is now available to all. You don’t need to have your own boat, or be a member of the Findhorn Yacht Club. Simon Paterson is doing wonderful things down at the ‘Marina’, having invested in a fleet of Topper dinghies, and sourcing great instructors. He offers sailing experience trips and courses, for adults and kids, ranging from two hours, to two, four and five days, as well as evenings in the summer. 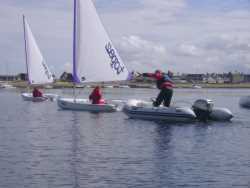 Findhorn Marina also offer more advanced courses, for example on spinnaker training, as well as onshore based navigation and offshore powerboat courses. So please take a look at his website for something that will definitely suit you, whether you are 8 or 80 years old.